With a fruitless canal pike trip with James last weekend and the weather looking a bit nasty for the weekend ahead I thought I'd fit a quick stick and pin trip in for a couple of hours today - between storms. 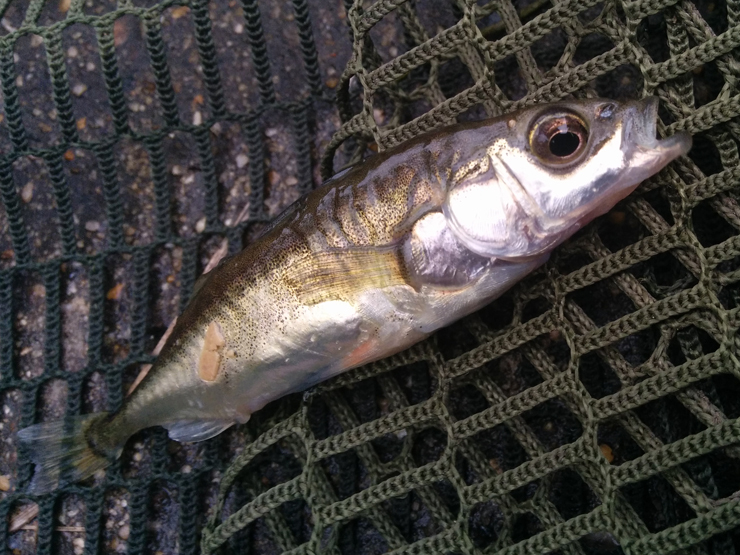 Gudgeon were at the back of my mind but using maggots any fish were welcome - and first up was this odd little fish, one of only a handful I've caught on rod and line - although me and my brother caught loads in minnow traps when we were kids. It's great in a world of pike, zander and even sharks & arapaima how much a tiny fish can make you smile! The rest of the short trip provided plenty of dace with a couple of chub in the mix, the best perhaps scraping the pound mark. No gudgeon, but I've had my fishing fix just incase tomorrows weather report is correct! And while I'm writing this I'm not really happy with the way the line flows through my new float rod, if anyone has any recommendations for a 12 foot, 3 piece rod (it has to be 3 piece because it will occasionally travel on the tube) - please let me know in the comments - thanks. Keep an eye out for a drennan series 7 competition float, it's a 3 piece, mine is 13' but I'm sure they made a 12' version as well. I rate these rods higher than the newer acolytes, not as slim, but still very light, one of my favourite rods. Another rod to keep an eye out for is the original preston carbon active float rod on an asaki blank, fairly rare and expense now, but a brilliant rod. I've always regretted selling mine. I had the S7 you mention and really enjoyed it but broke the tip section and then found out the rod was no longer produced and I couldn't get spares. This must have been 5 years ago. Quite shoddy from drennan as the rod isn't exactly old. Depends what your budget is but I'd recommend looking at Shakespeare rods. They tend to be good value but also an equally reputable maker of good kit, even if they are not as fashionable as the likes of drennan. They make several good rods which can be fished at more than one length. I have a 12/16' rod. Can't remember the name but at 12' it is a really brilliant rod for classic canal wag fishing and the longer length is a godsend when trotting. Thanks guys, I'll try and find a S7, something to track down on my lunch breaks. Was thinking I'll probably have to go into tackle shops and have a good look at them, James' Grey's rod is probably the best I've used for a centerpin but it only comes in 2 piece. There is only so much you can tell from a photo. Have a look at Daiwa (3 or 4 piece) carp rods. Thanks Ollie - I'll have a look (again something for lunch breaks) but it sounds like they might be a bit heavy for what is little more than stream fishing. I fished with the shakespeare Black Mirage 3 piece 12'. First time I've used it it years lovely rod for a late 80s early 90s even by todays standard. I remember it well - still got my Black Mirage Specimen (although it's now in 4 pieces instead of the original 2, the only broken rod I've kept - caught my first twenty on it - can't throw it away). I've still got my Alpha match rod at my parents, I'll have to have another look at it, they don't make them like that any more!